New thing! In graphic design school, we used a die cutter for a couple of projects, I was really into it, I checked craigslist juuuust in case and happened to find one used for less than half the price of a new one. 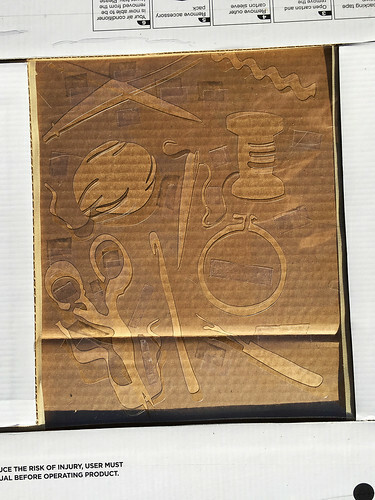 So I impulsively bought it, started brainstorming what I could use it for, and now I’ve designed and made a bunch of stencils! You can find them in my newly revamped etsy shop here. 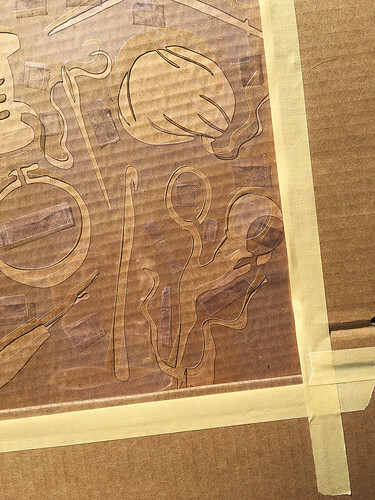 So first, about the stencils: they are made from thermal laminating sheets, run through a laminator with nothing between the layers, so they are basically sheets of plastic. 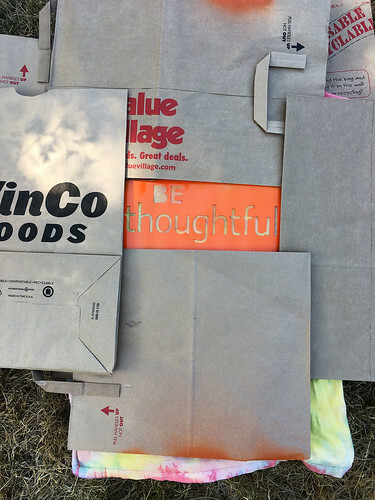 I wanted to use something better for the earth, and/or recycled/reclaimed, but I found that this option makes the best durable, reusable stencils. I played around with reclaimed transparency sheets, but they didn’t cut as nicely and they don’t hold up as well, so this was the best quality option I could come up with. 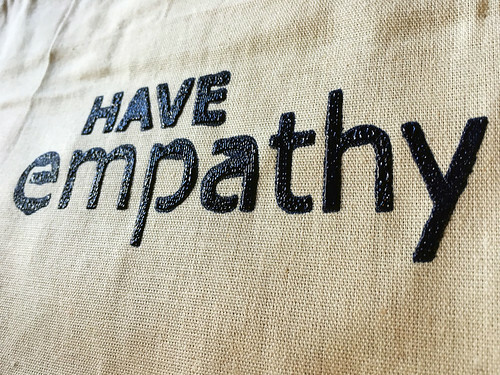 They can be used over and over if you’re gentle with them. 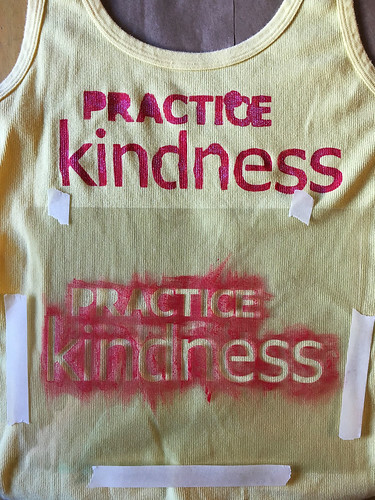 I’ve made two different types of stencils so far: words and repeating patterns. There are three of each type (for now, maybe more later! 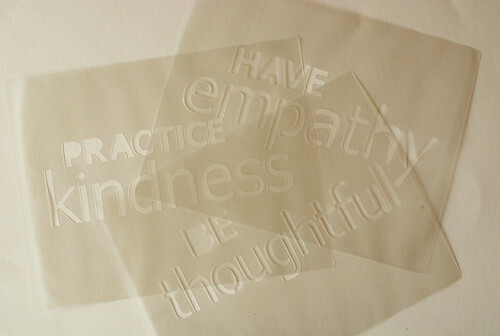 ), and since the word stencils kind of fit together, you can get all three in a set if you want. 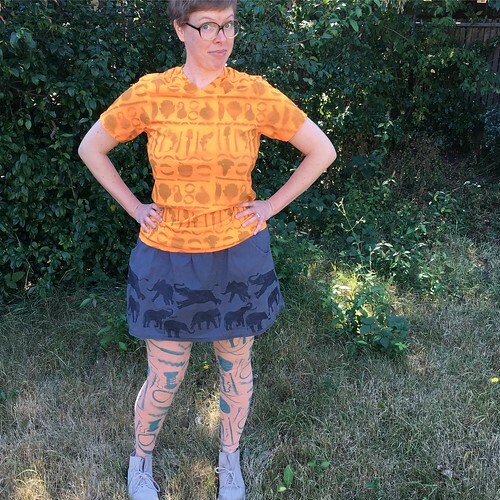 The repeating pattern designs are different from each other; they are just three random things that I love — craft tools, vegetables, and elephants! 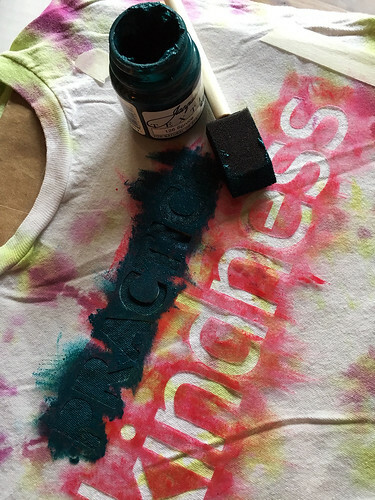 Before we begin, a note about paints. Be sure to read the label of whatever you decide to use. 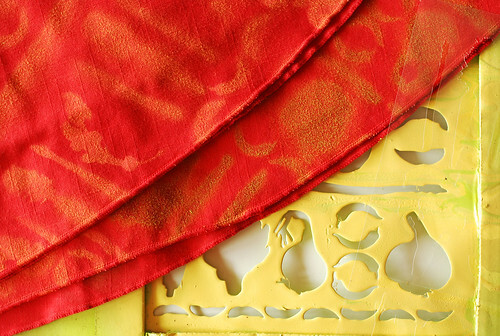 Many fabric paints need to be heat set (by ironing the fabric once it’s dry). 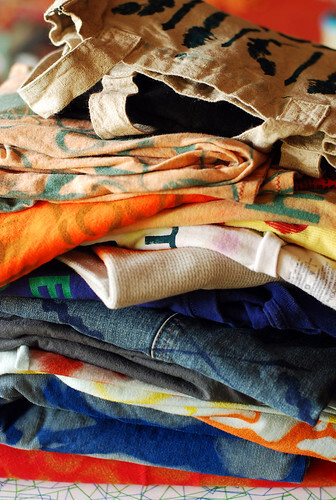 Others don’t need heat setting, but must set for 24-72 hours before washing. 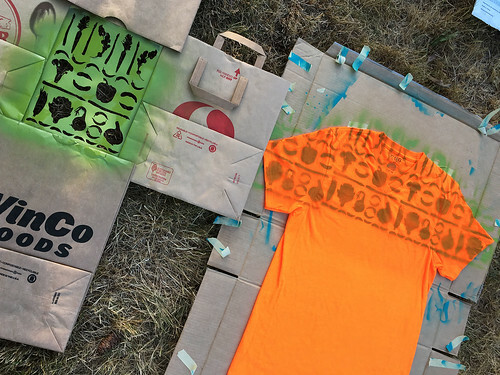 With all methods, it’s highly recommended that you put a piece of cardboard or paper grocery bag or something behind the layer of fabric you’re printing on, so the paint doesn’t bleed through to whatever’s behind it (the back side of the tee, for example, or the tabletop). Main pros of this method: it’s fast and easy. Main cons: it can be kinda blurry, and you need to do it outside or in a garage or something. You can see below that the paint did indeed float under a bit with this one, up by the collar, and down below, there are hints of orange. 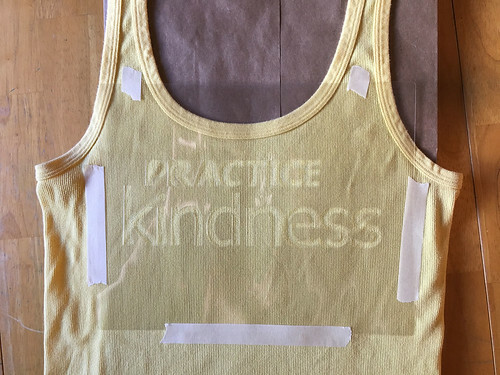 Also, if you want the stenciled image to be sharper, use 2-sided tape on the back of the stencil, to stick it onto the fabric. 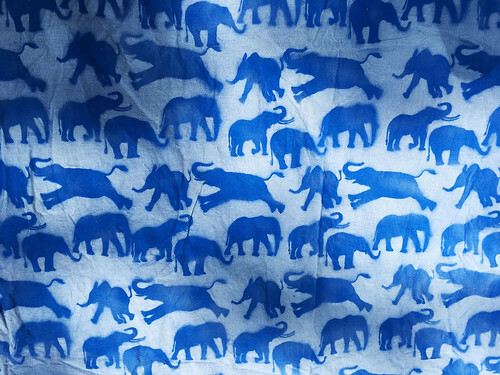 The closer the stencil is to the fabric, the sharper it’ll be. 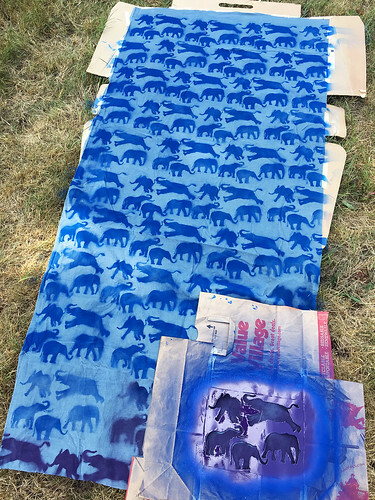 After letting the paint on the stencil dry for a few hours, I used it again with a different kind of spray paint. 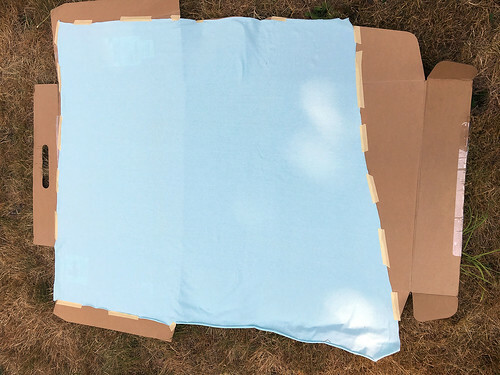 Above was just regular hardware store spray paint, which does work on fabric and doesn’t wash out, but it can be a weird texture. 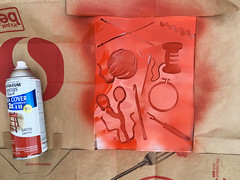 You can instead buy fabric spray paint, pictured below (bought at a craft store), which feels nicer on fabric, and I think tends to go on a bit smoother, making slightly sharper images. I painted this the same way as the orange one, no tape on top or bottom, and I think it did come out a bit better, and the paint didn’t leak under the paper at all (but maybe that’s because I held the can a bit closer, or another reason, who knows!). Main pros of this method: can look nice and clean if you’re careful, don’t need much space. Main cons: can get blobby if you’re not super careful, not fast. 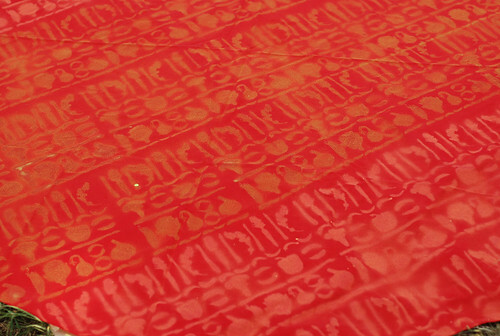 The above stencil is on its second use; the red paint has been dry for several days. 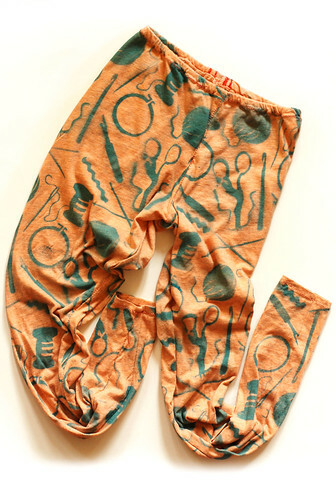 For this one I used Jacquard textile color paint. 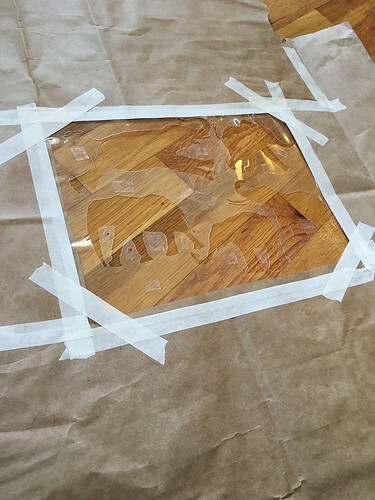 I highly recommend taping down your stencil for this method so it won’t move around. 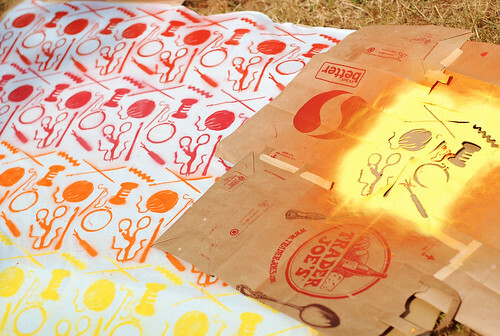 Hold down the stencil right around where you’re painting as you go, with your non-painting hand. 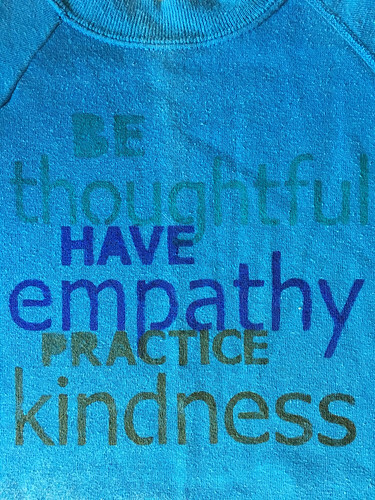 It’s a good idea to also put pieces of 2-sided tape on flappy bits of the stencil, like insides of letters like c, e, n, d, etc, for example, since it’s hard to hold those down with your fingers as you paint. I did not do that here, and I got some unsharp edges but they may have just been a result of hurrying and not being as careful as possible. 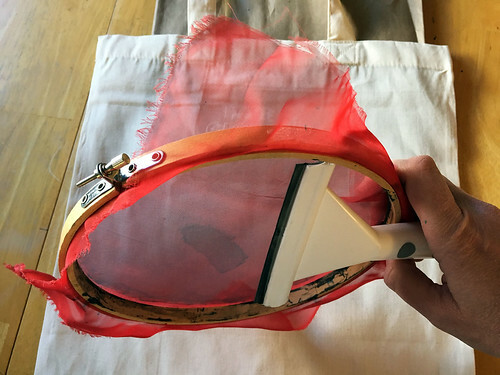 Always dab the brush up and down, or in from the edges onto the fabric, never into the edges from the fabric. 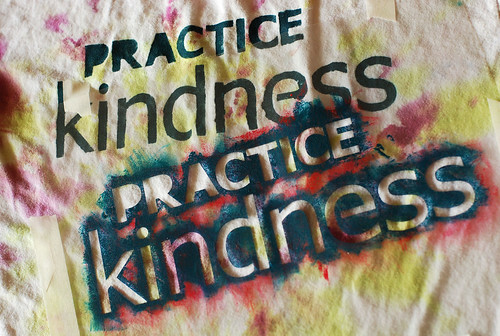 And very important tip (learn from my mistakes): use minimal paint on the brush. 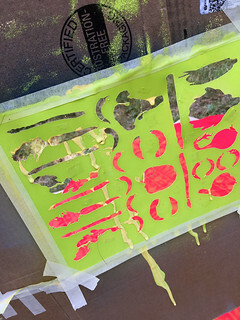 Blobs of paint will result in blobby stenciling. 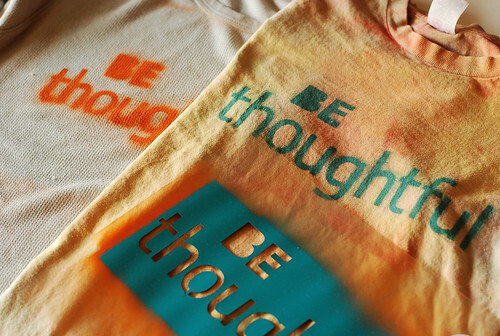 That one above turned out pretty well, mostly because I learned from my own mistakes with my first go at it, pictured below… Firstly, I don’t recommend this kind of ribbed knit; the paint went on okay but since I didn’t stretch it while painted, the letters stretch and distort when I wear it. 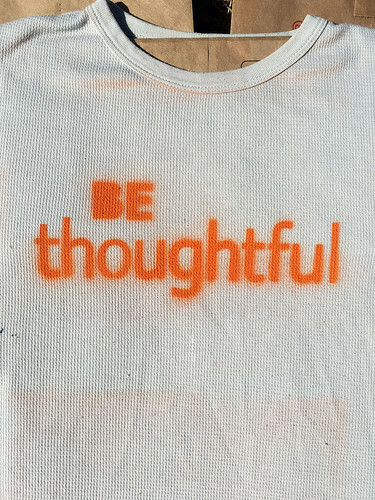 If you do want to stencil onto something stretchy, try to stretch it approx the same amount that it’ll stretch when worn. So I ended up with a messy stencil job. Main takeaway about the sponge brush method: don’t rush it! 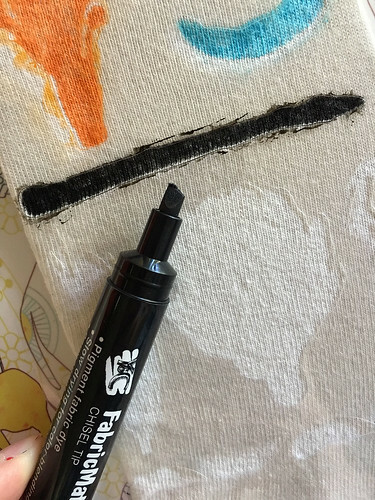 A smaller amount of paint on the brush will take longer to dab onto the fabric thoroughly, but it’ll be worth it for sharp edges! 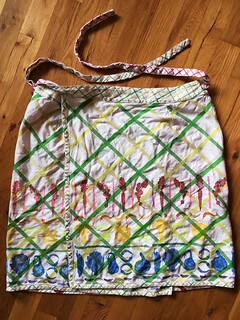 I used a sponge brush for this tote bag, which doesn’t lie flat, so I held each part down carefully with my non-painting hand and went slowly, and it turned out well. 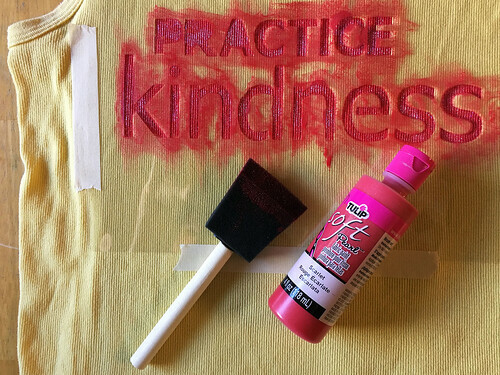 Note about this method: it would probably work similarly with a normal paintbrush, if that’s all you have and you want to give it a try; just use the same tips about going slowly, dabbing up and down at the stencil edges, etc. Main pros of this method: clean edges, easy to use multiple colors if you want to, don’t need much space. 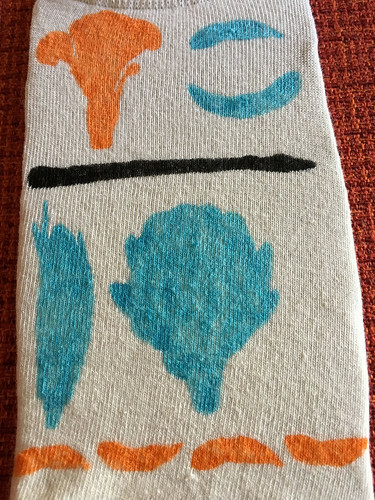 Main cons: filled color can look a bit uneven, somewhat slow (but faster than sponge brush). 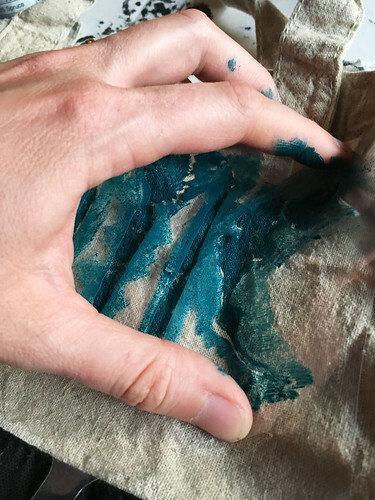 To test out this method, I first bought three different types of markers at the art store — one brush tip, one wide tip, and one chisel tip. They all worked, but the brush tip was best/easiest. 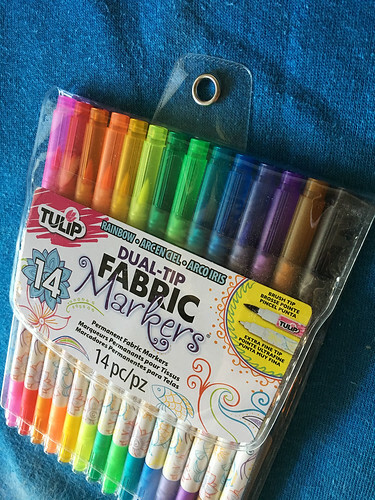 So, I went and bought a whole set of brush tip (actually, they are dual-tip) fabric markers at the craft store. 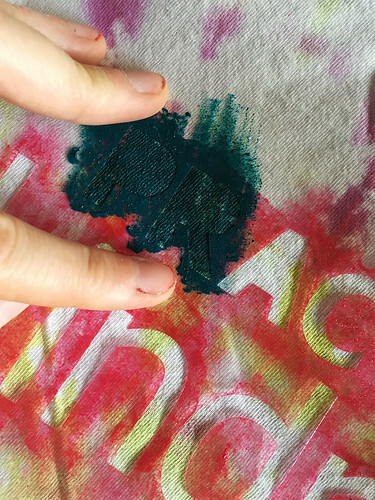 For this method, simply color in the stencil, being careful around the edges so color doesn’t get underneath, holding the stencil down with your non-coloring hand same as with the sponge brush method. 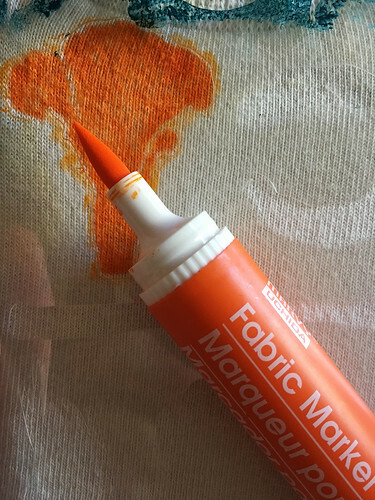 Important note: when I reused a stencil that had been spray painted (and fully dried) it seemed fine, but when I reused one that had dried Jacquard paint on it, the paint bled into the marker color; same for dried fabric marker. 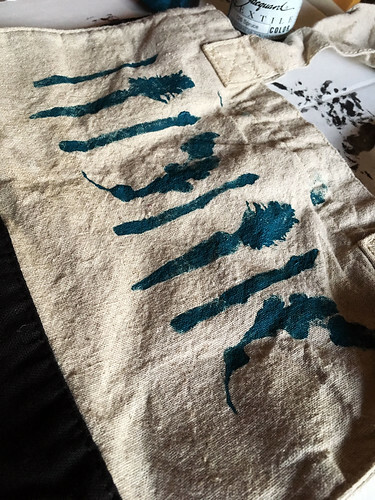 So if reusing a stencil, test it out on scrap fabric first, or else choose a marker color that’s the same/similar or will blend well with the dried paint. You can get some really color effects by purposely blending colors from the stencil edges! Main pros of this method: can look very good/clean, the actual printing is quick and you can do multiple prints in a row. Main cons: more tools needed than other methods, and some space, and extra cleanup time. 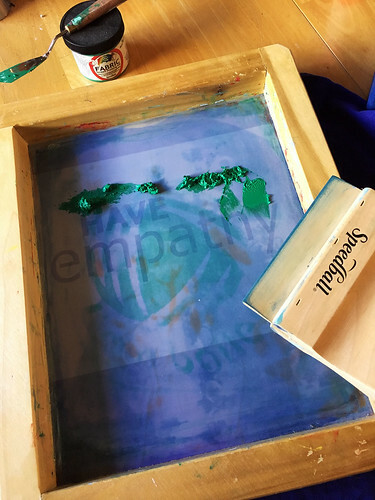 This method works like normal screen printing, but you’ll use a blank screen placed over the stencil. 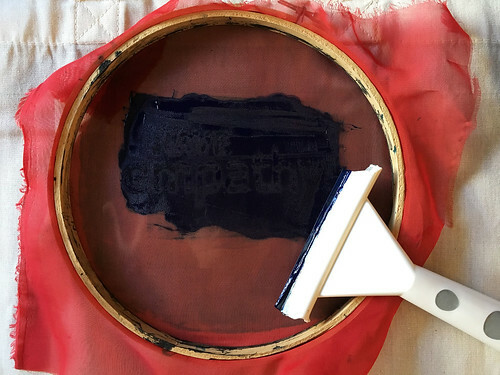 So you need a screen, a screen printing squeegee, a stable surface, and fabric paint that’s meant for screen printing. I also used a palette knife to get the paint from the jar onto the screen. 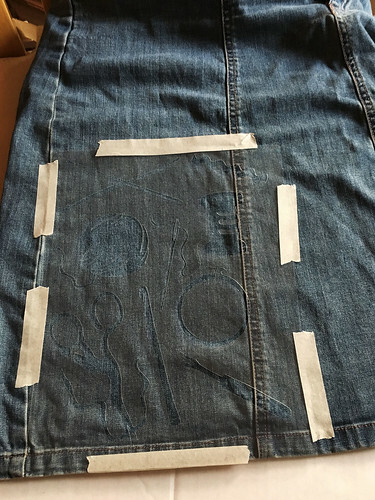 Place the stencil where you want it on the fabric, then carefully place the screen on top. 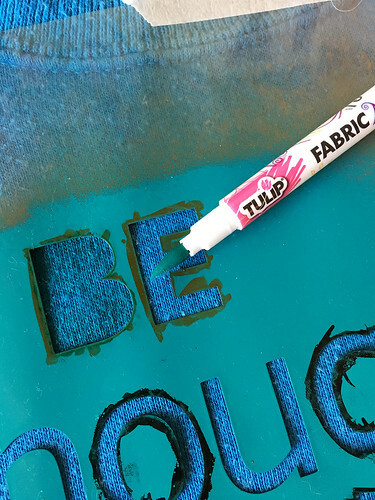 If you want to be extra careful, and/or if you’re using a stencil that doesn’t have much blank space from the image to the outside edges of the stencil sheet, place some thick paper around the sides of the stencil so that you won’t get paint onto the fabric at the edges. 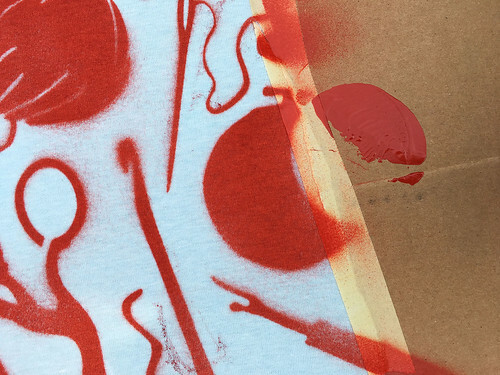 (I did not do that in this example, I was just careful to keep the paint within the stencil sheet.) 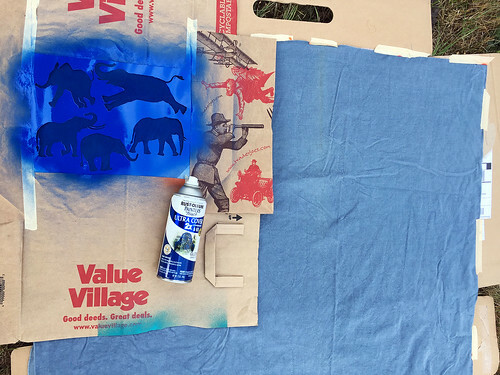 Put some fabric paint in a row along the top, above the stencil image (but not above the actual stencil sheet!). 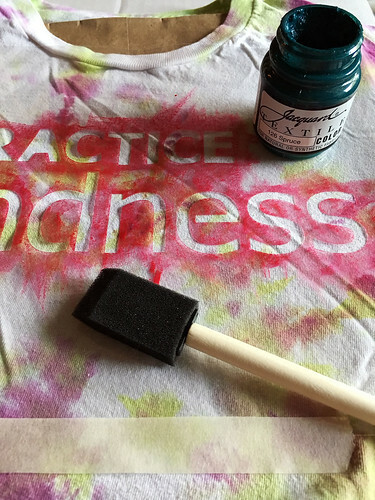 Use the squeegee to pull the paint over the stencil, with pressure to push it through to the fabric. Run it back and forth a few times. 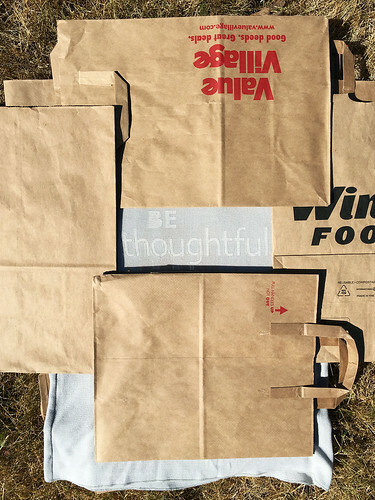 Be sure to cover the whole stencil image. I did not do that! I missed the side of the y at the end there. 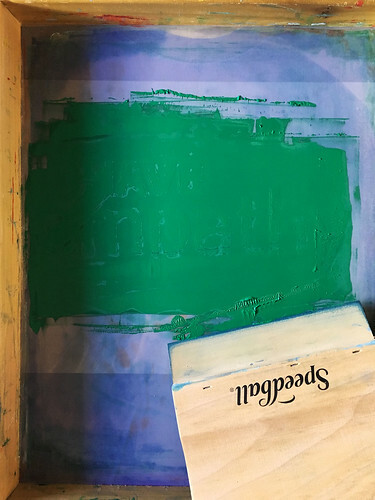 Also, my paint was like ten years old, so it was kinda globby, which I think contributed to how it didn’t cleanly fill in the right side there. The rest of it turned out nice and clean though! 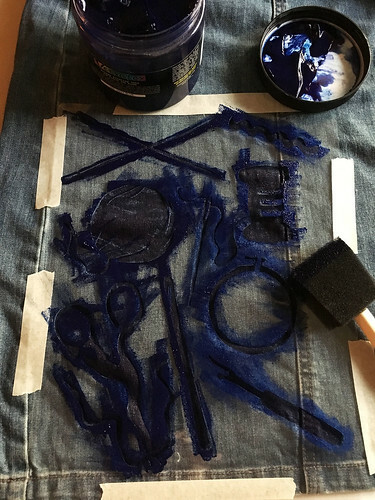 If you’re careful, the stencil will be stuck to the screen with paint, and you can set it onto another fabric item and print it again, as long as the stencil doesn’t shift on the screen. 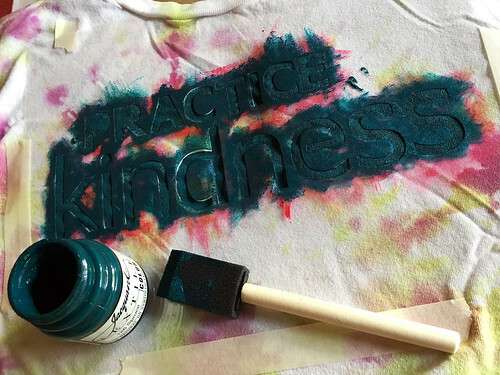 If you want to try out this method with cheaper tools, but potentially slightly messier results, you may be able to use things you already have. 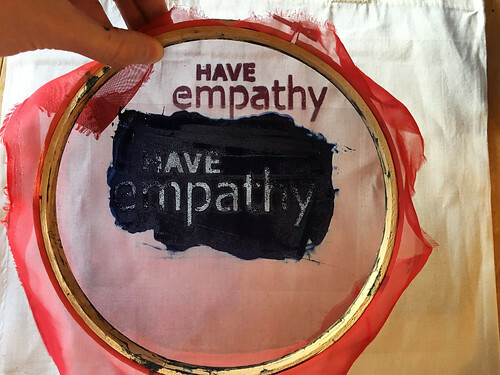 You need: an embroidery hoop big enough to fit the stencil, a piece of mesh fabric bigger than the hoop, a squeegee of some kind that can fit in the hoop, and fabric paint. 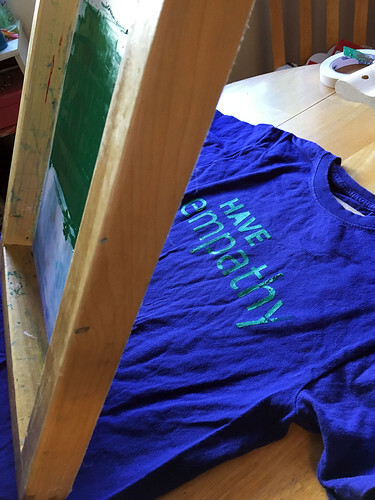 The homemade screen I have is smaller than the stencils, so I used a mini-stencil just to show you. My squeegee is a cheapo (dollar store?) one that I broke the ends off of to make it fit in my hoop. 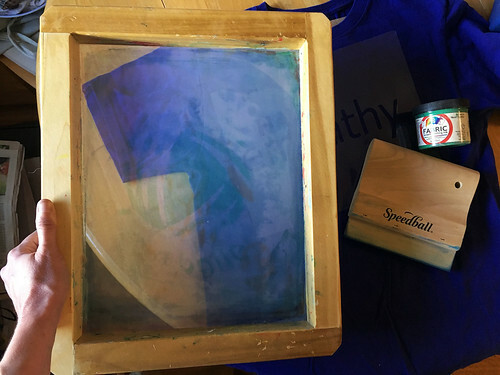 You can also use an old credit card as a squeegee — that actually might be the better option since I think you get cleaner results from a harder squeegee and this one I used is much softer than the screen printing squeegee. 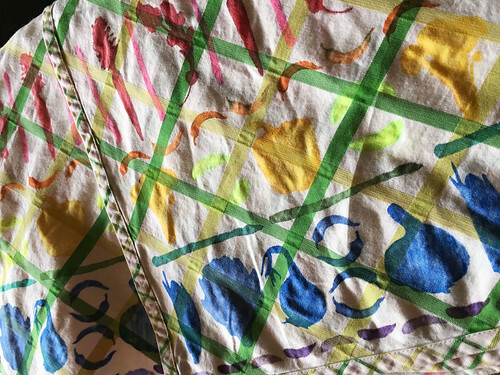 The denseness of the mesh fabric will determine how much paint gets through and how clean the print is: denser mesh equals cleaner print. 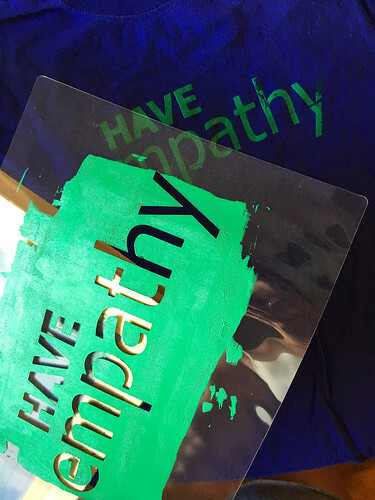 You can also buy screen printing mesh for this. 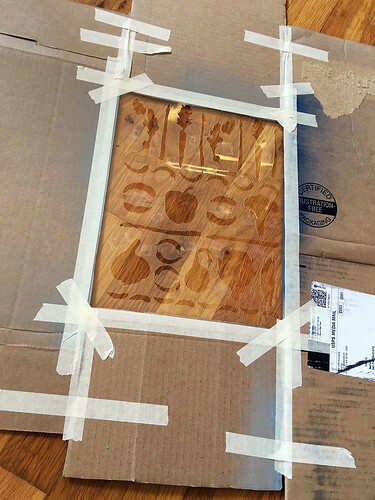 Same steps as above, place stencil, place screen over it, paint goes onto stencil sheet above stencil image. 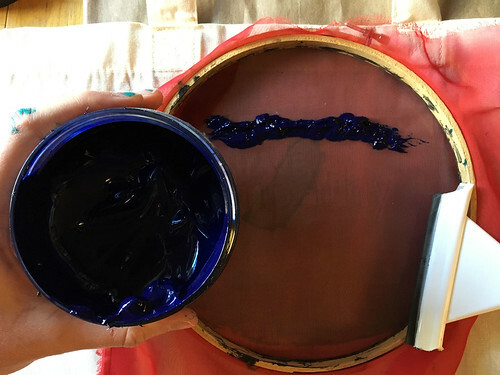 Pull the ink over the stencil. 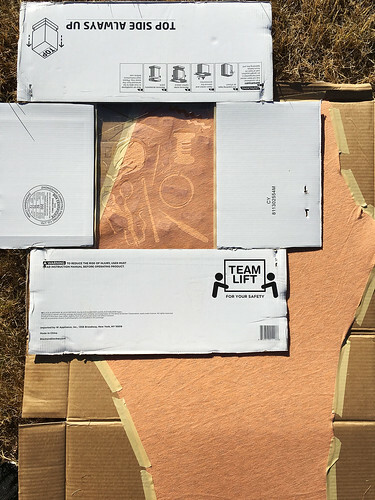 And lift it up to reveal your print! I either used a bit too much paint here, or it’s just that my mesh isn’t dense enough and/or my squeegee is too soft, because my print isn’t super clean. But it looks okay, mostly just a bit thick. Anyway, play around with that if you have a big hoop and some mesh fabric! 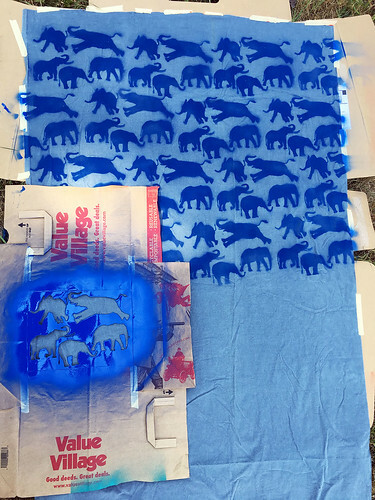 With repeating stencils, I recommend any but the screen printing method, depending on exactly what you want to do. 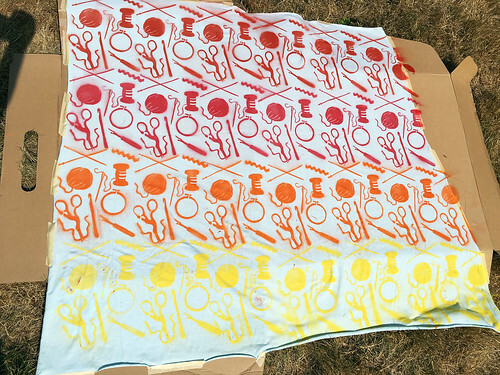 Screen printing is not recommended for this mostly because it would be difficult to line up the repeats, and you’d need a lot of space. 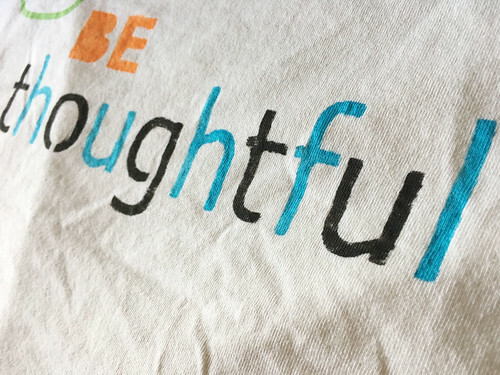 For printing directly onto clothing, the sponge brush or fabric marker methods will give you the most control. 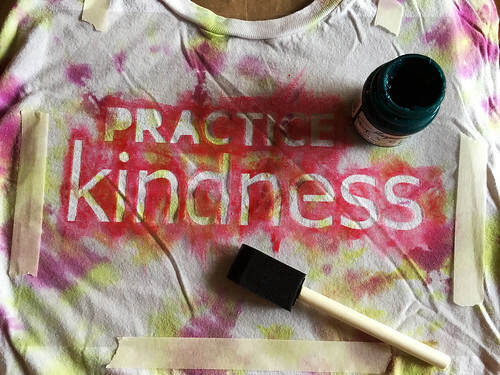 The sponge brush will take longer because you’ll need to let each repeat dry to the touch before doing the next one, since the stencil will overlap on top of the paint. 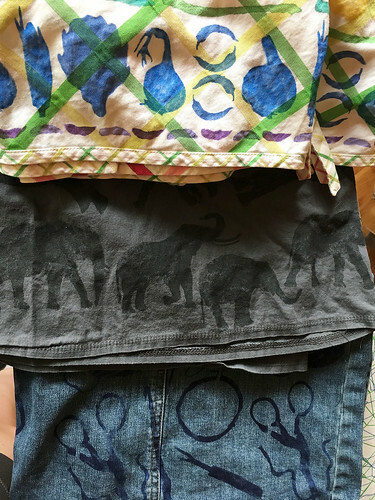 I did the craft tools on the skirt above with screen printing paint, and I sponge brushed the elephants on the skirt below using craft store fabric paint (same type of paint as the red blobby one up above, but I was careful here to limit my paint amounts and I got clean edges). 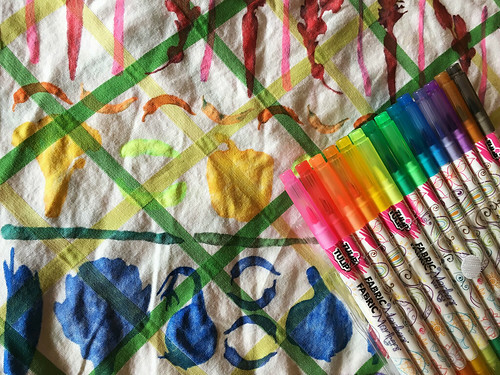 And I did the vegetables below with fabric markers. 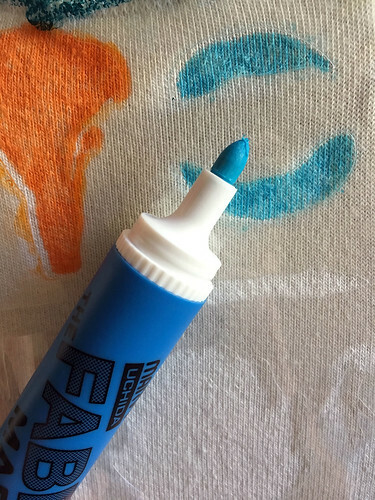 The marker method goes much faster here because you don’t need to let the paint dry between repeats, since the marker ink isn’t wet enough to be able to smear when you place the stencil overlapping the previous repeat. 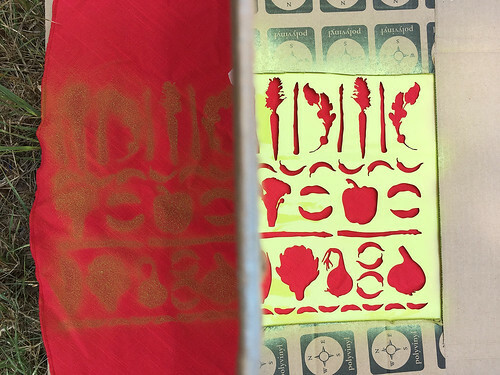 All three of these were repeated along the bottom of the skirts, so only one row of stencil, repeated across. 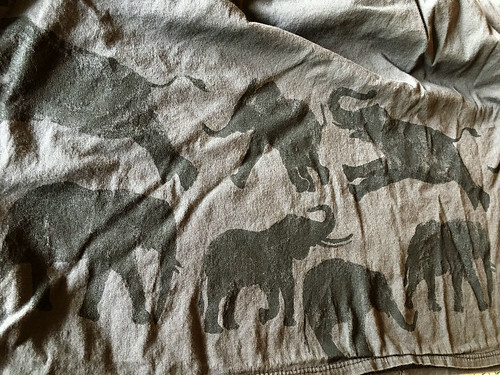 The elephants and rainbow vegetables go all the way around, and the craft tools are only on the front. 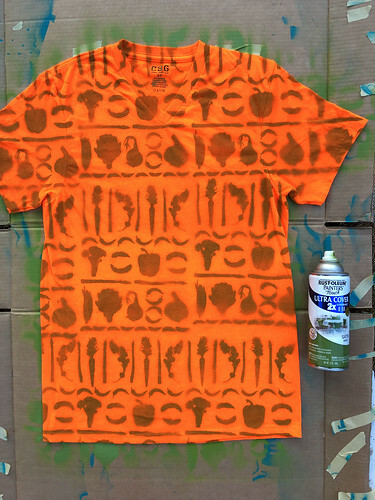 Here’s another example of using a pattern stencil on clothing, but not repeated: I stenciled some of the vegetables onto a pair of socks, pulling the socks over cardboard rectangles so that they were stretched a bit. 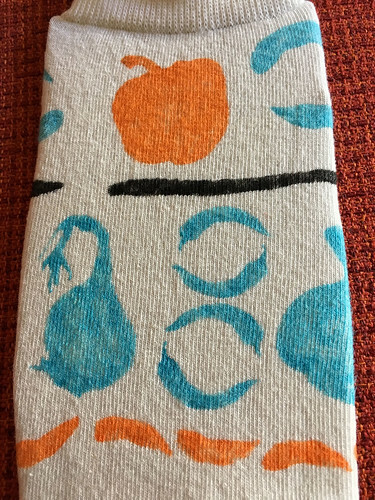 I stenciled each side, and then turned the sock a bit around the cardboard to get the part that needed to wrap around. 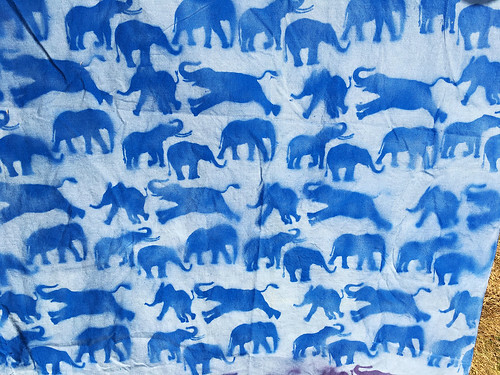 Then there’s the option of stenciling whole pieces of fabric! 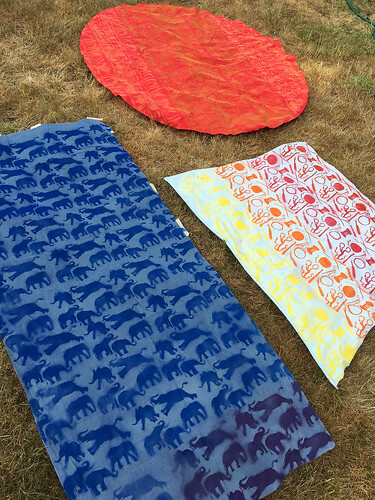 All the pattern stencils are designed to be able to repeat across and up and down, so they can be all-over patterns. 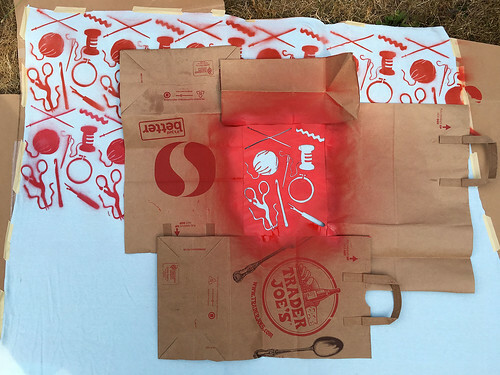 For this, I recommend spray painting, because the other methods would just take so long. 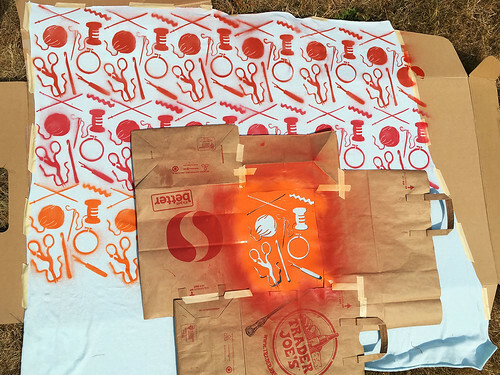 For spray painting with the pattern stencils, you’ll need to securely tape paper or cardboard around all the sides to protect the fabric from the paint. Tape it all together super securely! You don’t want things coming untaped as you’re painting (trust me)! 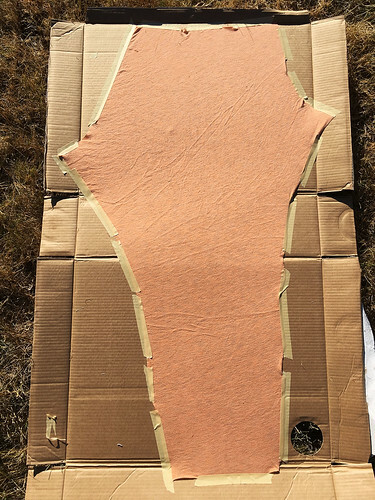 Tape can go over the stencil, just make sure all the holes are clear. Put tape on both sides. 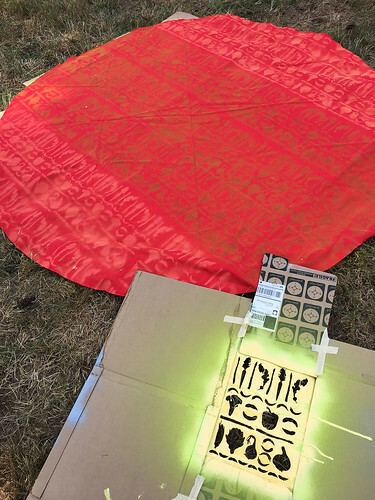 Especially if using cardboard, overlap the stencil over the paper/cardboard with the wrong side of the stencil up, so you’ll place the stencil on the fabric with the stencil side down, touching the fabric. 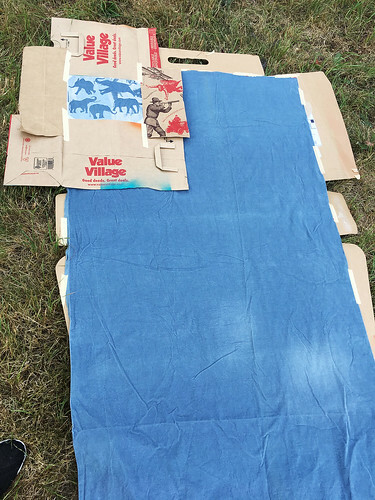 (So the stencil isn’t raised up off the fabric the width of the cardboard.) I recommend putting 2-sided tape on the side that will touch the fabric, just to help it out to touch the fabric as much as possible. 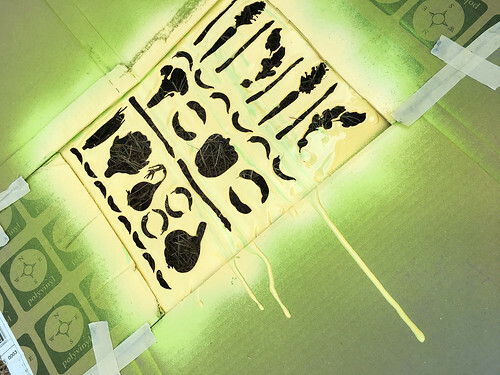 Now, lining up the repeats is a bit tricky since your stencil isn’t see-through anymore, once there’s paint covering it. 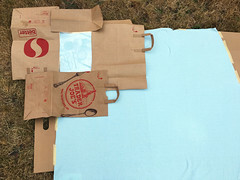 You’ll need to look through the holes, and also pay attention to where things are lining up, like if the top edge of the paper taped to the stencil lines up with the top edge of the cardboard under the fabric, then keep those lined up as you repeat across the row. 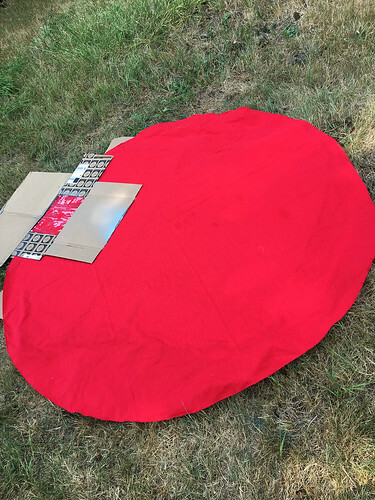 For this next one, I was using a knit fabric, so I stretched it a little, smooth over the cardboard. It went beyond the cardboard there at the bottom, but it’s taped underneath in a couple of spots. Same deal, start at one corner and repeat across the first row. 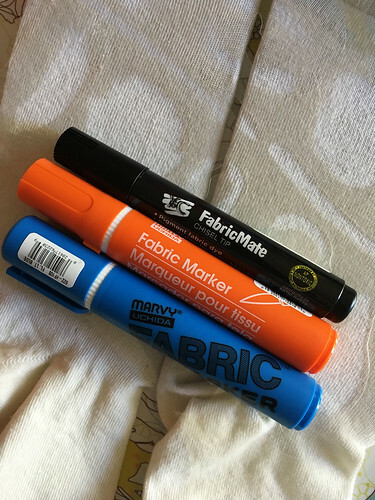 For all of these, I used normal (non-fabric) spray paint. And changing colors here for each row. 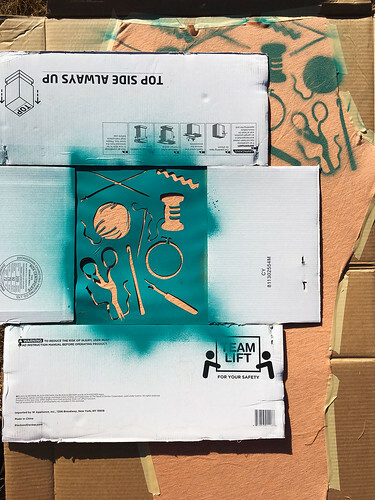 This stencil was taped to cardboard, so to line up the repeats I lifted the one side of the cardboard (the lifted side is the blurry line in the photo below) to see the previous repeat next to the stencil. 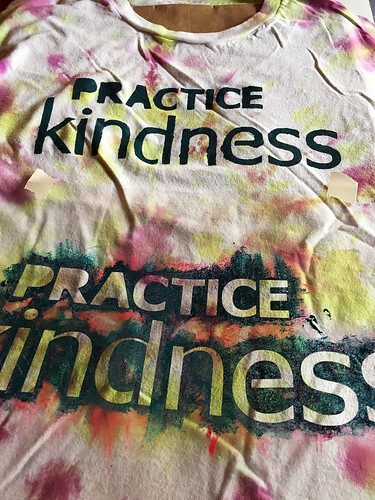 Here’s another big learn from my mistakes tip: the tape on this one started coming undone in the middle of the repeats, and I was trying to fix it, wiggling the stencil around, turning it upside down, and the paint started dripping all over the place, on the front and back sides! 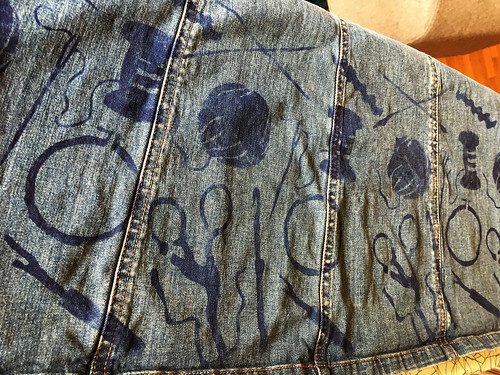 This made the stencil unusable until the paint could dry, since there were drips on the side that would touch the fabric. 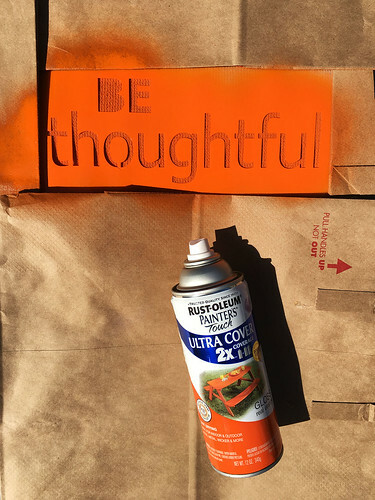 So tape thoroughly, and be careful and gentle as you use the stencil! 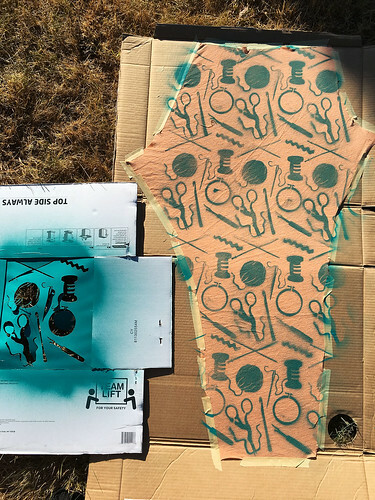 Another tip about spray painting a lot of repeats: wear disposable rubber gloves if possible, at least on one hand, because once the paint starts to build up you may want to touch up edges of the stencil, remove globs or blades of grass, etc. If you don’t wear gloves, spray paint is really hard to get off your fingers (TRUST me). 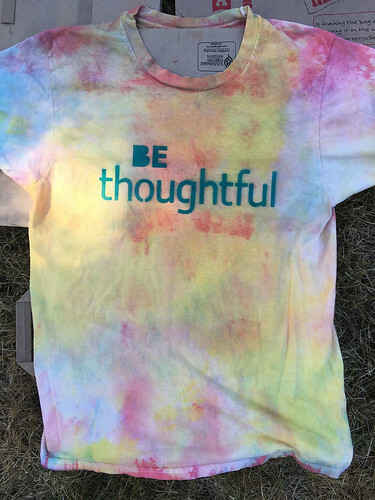 Here’s a smaller repeat job I did with spray paint — the front side of a tee. Same deal, just line up the repeats across the rows. 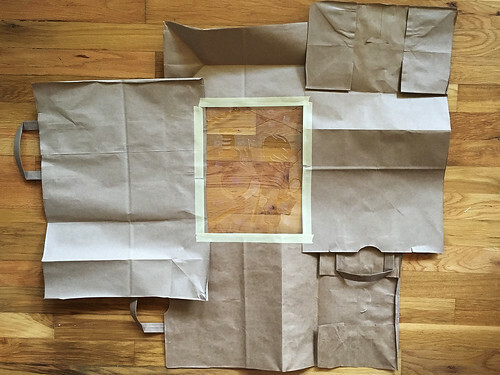 Same process, tape down the fabric (stretched!) and stencil the repeats to cover the whole piece. 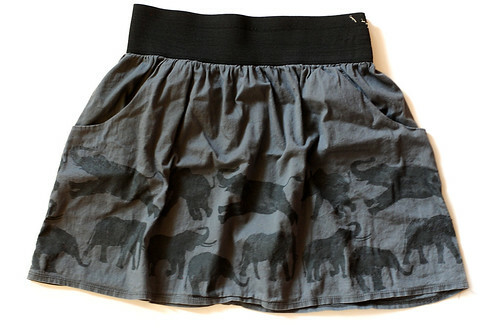 For this, I used the fancy fabric spray paint. I was not stingy with my application, especially at the beginning when I was still getting used to it, and I ended up using up the entire can about 1.5 legs in. Had to run to the craft store to buy another can and finish the job. 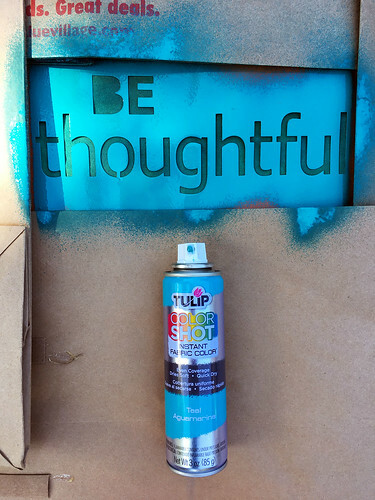 So, I recommend just normal spray paint for large jobs, because they use so much paint, and/or if using the pricier paint, don’t spray more than is needed.